Alright, I'm 10 days late. 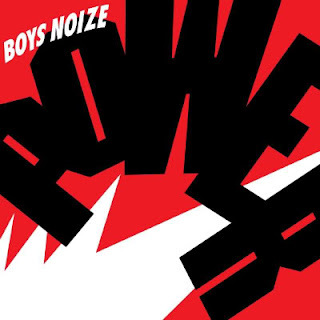 But who cares when it's to anounce the upcoming album... of Boys Noize? It got announced last week on Boys Noize's blog. The name is going to be Power and will have 12 awesome tracks. It should be out around September 25th. Here is the tracklisting (with of course, a link to the only 2 songs I was able to get my hands on). There are some previews on the web, but I hate posting bad quality songs or incomplete songs so if you really want to listen to the maybe 1 or 2 previews left on the web (they all got removed by BNR), just search the Hype Machine. From what I can see (listen...), it's going to be an awesome album. It seems like it will keep the "old school" Boys Noize's style but with a little touch of new-ness. It's more of a style that everybody can listen to (less effed up I guess). Enjoy the song Jeffer, it's amazing. Starter is good also, but effed up. Oh and by the way, they are from the Starter EP. I didn't post this enough in previous posts: THESE ARE USED ONLY AS PREVIEWS, IF YOU LIKE THEM, BUY THEM. They aren't on iTunes though. They are on Beatport. This entry was posted on Wednesday, August 12, 2009 and is filed under Boys Noize. You can follow any responses to this entry through the RSS 2.0. You can leave a response.